Quick sort uses divide and conquer algorithm. First will be divided in to two parts based on some pivot element. All elements which are less than pivot element will be placed left and and all elements which are greater than pivot will be in right part. So now pivot element is exactly in middle. if we sort left and right side elements all elements will be sorted. Here recursive quick sort will take place in order to sort all elements. 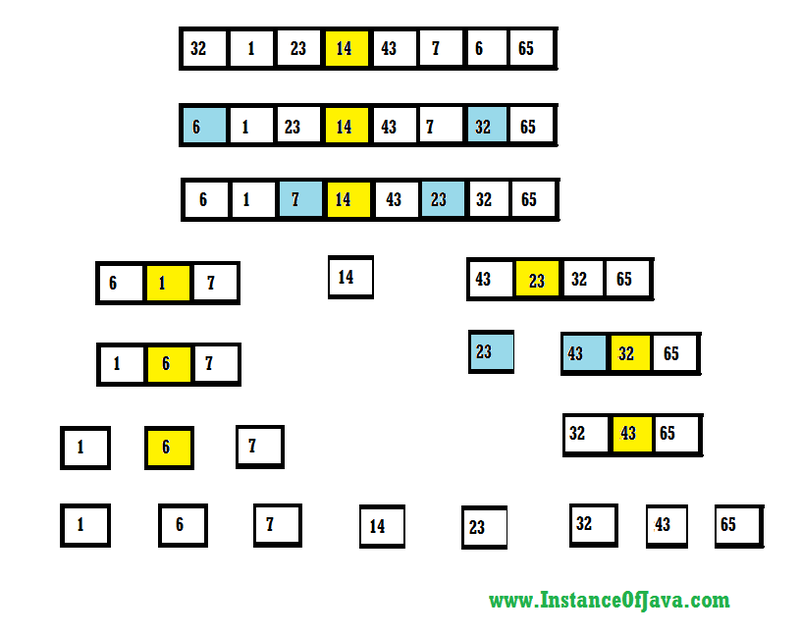 Quick sort will be sorting these elements without using extra space that is the reason it is called in place sorting algorithm. Using the first or middle elements as an pivot element. it splits the arrays by re arranging the elements like every thing that is less than pivot will come left side and all elements greater than or equal to pivot will come right side. Now pivot is in middle and correct place it left and right arrays sorted then entire array will be sorted. Quick sort exactly will do the same it will sort left and right recursively. If size of input is very less merge sort will be time consuming. For smaller inputs quick sort is faster than merge sort. Time complexity of Quicksort default case is O(n log n). Worst case Time complexity of Quicksort is O(n2). Create a array with some elements. Choose pivot element as middle element. we can choose first or last also. After choosing pivot element arrange the elements like all elements which are less than pivot value comes left side and elements greater than equal to pivot come right side of pivot. And then apply same to both sides. until it becomes one. then all elements in array will be sorted.